Pickleball is back and better than ever! The Minto US Open Pickleball Championships Powered by Margaritaville will take place April 28th– May 4th at East Naples Community Park in beautiful Naples, Florida. 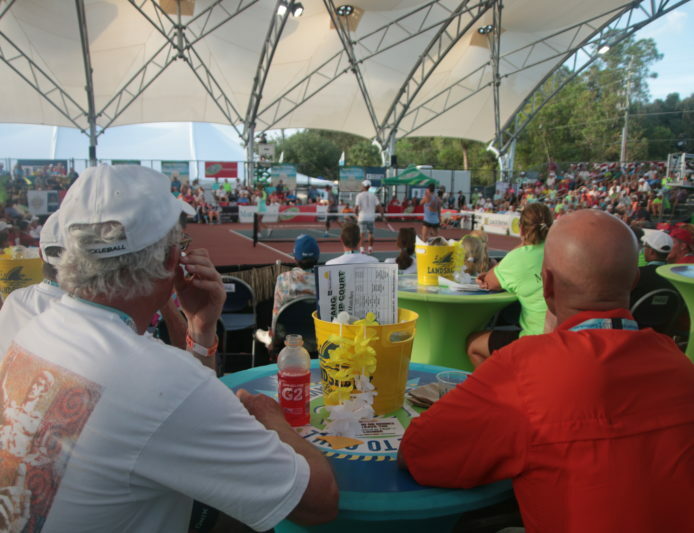 The event is free to the public and spectators will enjoy the biggest pickleball party in the world. Come join the fun with live music, corn hole, LandShark Lager at the LandShark Beer Garden and more! Radio Margaritaville’s JD Spradlin will travel down from his new home at Margaritaville Resort Orlando to broadcast live throughout championship weekend. In 2019, 2,161 players will compete in 4,345 matches to crown the pickleball champions. 15 countries will be represented including Australia, Brazil, Canada, Columbia, Finland, Germany, Italy, Poland, Russia, Singapore, Spain, Switzerland, Thailand, United Kingdom and the United States. The furthest traveling player, Chris Cho, will be coming all the way from Thailand, a total of 9,418 miles away. The youngest player is only 10 years old, with the oldest being 87 years old. 48 of the 50 U.S. states will be represented at the tournament. If you’re new to the sport, pickleball is one of the fastest growing sports in America and combines aspects of ping-pong, badminton and tennis to form a game that is fun for all ages. Before you head to Naples, check out our Ace’s Guide to Pickleball and Pickleball Terminology to fully get it in the game this year. Get all the tournament details at USOpenPickleballChampionship.com.